There are days I get so mad at myself. Mad that I was impatient or mad. Today while making dinner after work, Sammie was getting ready for basketball. She came into the kitchen to ask me if her clothes were ok. They were new and she wasn’t sure if what she was wearing fit right. She was talking and I turned to stir the pasta on the stove. “The shorts are just a little loose, Mom.” Sammie says. I turn toward her and she is looking down at her basketball shorts. “The drawstring on your shorts. I can tighten it if you are worried.” I am getting flustered as dinner is starting to boil over and my 7 year old runs in talking at us about an Easter egg he found. “I DON’T KNOW WHAT YOU MEAN!! !” Sammie bursting in tears. I swear I can feel my blood pressure rising and then I realize she couldn’t read my lips. Deep breath. Calm down before speaking, Jen. I grabbed her hands gently from her face. Tears pouring out her eyes. Deciphering whether the kids are not hearing or not hearing is VERY difficult. I have been doing this for nearly a decade and it is still very hard and very frustrating. I am mad that I am frustrated at times. I love my kids. They are my life. I know they get mad at me too. The time we have been waiting 6 months is here. Both kids have their implants on. It amazes me how different they reacted to their activation. I was shocked initially because I expected the opposite reactions from each child. With Sammie, who was born hearing impaired, we had always been strong and tough. She was aggressive since the second she was born. Demanding what she wanted in life always. Being hearing impaired and eventually deaf was NEVER an excuse for anything. To be honest, I believe it is what has made her so strong. It helped her focus on what she wanted. She could focus on writing, reading, and sports. I talk to my mom friends and they tell me of things their daughters “heard at school” and Sammie did not. Drama that went unnoticed, comments that may or may not have been made under breath, never heard. I am thankful for that. She knows what is truly important. Like I said, she is a girl that knows what she wants. So when she broke down in tears when that implant was turned on, it was heartbreaking. She got what she wanted. She loves that thing. She spends her summer days just listening. I love watching her experiment with sound. It makes me so happy. I know we all made the right decision. Jacob has just had the hardest time with his hearing loss. Last year, he lost most of his hearing. I was at the school every day because he refused to go into the classroom. His hearing loss isolated him. It was not part of who he was. It devastated him. His friends though he was ignoring him, because he did not respond when they talked to him. He thought his friends were ignoring him because he never heard them talk to him. He was too embarrassed to ask the teacher for help when he didn’t hear instructions. Our happy, funny boy turned into a depressed, anxious mess. Every time I sat him down in his classroom reluctantly, I was crying on the way out of the school. God bless the teachers, principal, and office staff that gave me tissues and hugs every morning on my way out. I just wanted to be strong for him because I knew that being deaf was not the end of the world. His sister was thriving. This was so much harder because he understood that there was something “wrong.” On top of all he was going through, he was being bullied at school. A kid threw a rock at his head at recess, dumped corn on him at lunch, and teased him. He did not tell anyone until he got home. I just wanted to protect him. I found myself watching over him 24/7. He just wanted to be with me. It hurt us to see him having a hard time. We were constantly trying to find the right balance of what we really wanted to do, snuggle and protect him from the world, and what we felt was best for him, nudge him towards acceptance and progress. I think he would just sit on his computer all day if we let him. So when he was all, meh, when his CI was turned on….I was shocked. The kid that had been an emotional wreck for 2 and a half years was just smiling. What the H-E-double hockey sticks?! Now, I will say that he cried all weekend because of a headache. He did not want to wear the implant. He was a mess. Today was a better day though. He listened. He played. He seemed genuinely happy. 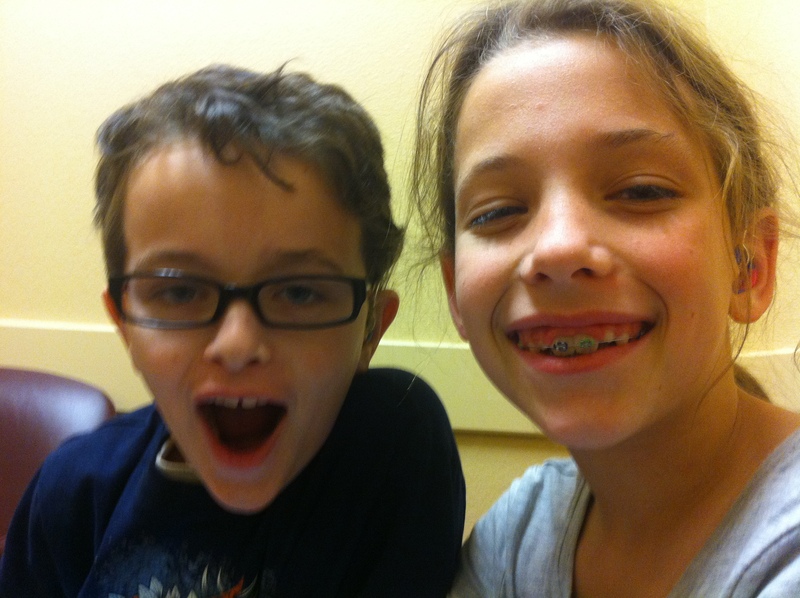 I am a hearing mother trying to understand what it must be like to be deaf like my 2 oldest kids. Trying to see what is best for them. They are amazing kids. AMAZING. We tell them to be tough, to be aware of their surroundings, and we are very protective. We teach their friends and our friends how to best communicate with them. We try our hardest to get our kindergartner to understand that there is a difference between not listening and not hearing. We research, push them harder, cuddle them, give them opportunities, and pray. Last night, we went to a hockey game and by pure coincidence, the ASL high school students were signing along to the National Anthem. We walked over to say hello and they were signing fast and furiously. Smiling faces and excited to be there. We froze, except my husband, not having a clue what they were saying or what to sign back. I wanted to kick myself for taking so long to learn sign language. Sammie is very motivated now to learn since summer is coming up and she plans on spending most of her time at the pool. Also, to help with sports. Jacob has been hearing impaired for 2 years now, with a rapidly progressing loss. He feels isolated, alone, and is struggling socially to communicate with his peers. He wants to hear what everyone is saying, but often hears, “ugh! Never mind.” when he asks what they said. He has cried many, many mornings on the way into class and many evenings at home. My heart breaks for him. I often joke with the school office staff that they need a tissue box with my name on it. I just wish I could say, “I understand what it is like. I understand your every day hurdles, victories, and I know what to do.” But I am not deaf. How can I really understand? I look forward to reading Sammie’s part of this blog and watching her video diary. She has never really talked about being deaf until recently. Jacob will add to this when he is ready, but it might take a while. I fully agree with my friend Tammy, what Sammie is doing is priceless!!! Thank you very much to Sammie and her wonderful mother for helping to the deaf community and specially to the small hearing impaired children. I am considering creating a blog or write a book about my journey to share with young adults and parents of children who are going through the CI process!!! It has been a CRAZY winter with 5 cases of flu, 3 strep, a CRAZY basketball season, and trying to keep up with it all. Sammie was just approved for her 2nd CI today and I came on to update and saw your comment! I am sure she and her brother would love to skype or pen pal!! !